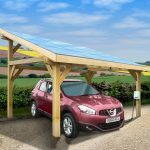 Whether or not you are considering buying an electric car, if you have the opportunity I would unequivocally recommend having solar panels installed. 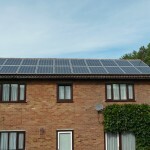 We had solar fitted in 2010, even before it had dawned on me how bad the situation had got with global warming. I did it then for the money, and for a measure of energy independence. However, it is a decision I have never regretted; in fact it’s one of the best things I’ve ever done. The timing was lucky – the UK government was in the process of introducing a Feed-In-Tariff (FIT) for solar and other ‘microgeneration’ technologies. Some solar suppliers were undertaking advertising and marketing campaigns, and I began to get interested when I saw a display outside our local DIY warehouse. I contacted this company and after various dealings with them (including a fairly ‘hard sell’ home visit) I decided to have nothing further to do with them. 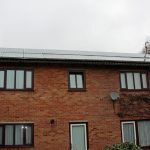 However, my interest in solar had begun and I began to research it, and applied for quotes from various companies, followed by home visits from a short list of suppliers. From those I chose one, and when the installation went ahead they did a very good job. Step 1 is a site survey. This looks at the roof type, condition, location and direction. It includes measuring its length, width, the height of the ridge, and the height of the gutter edge, so as to determine it solar capacity – i.e. how much area it covers and at what angle to the sun. 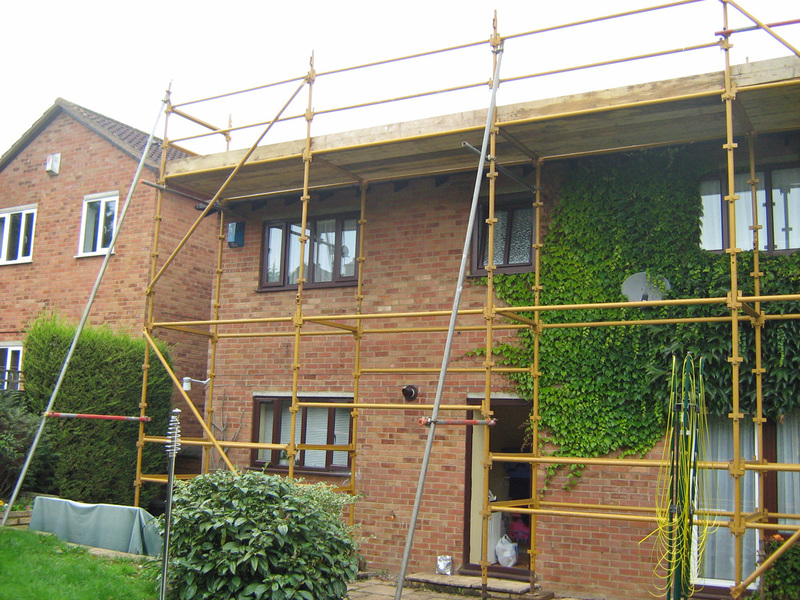 Step 2 is the scaffolding. 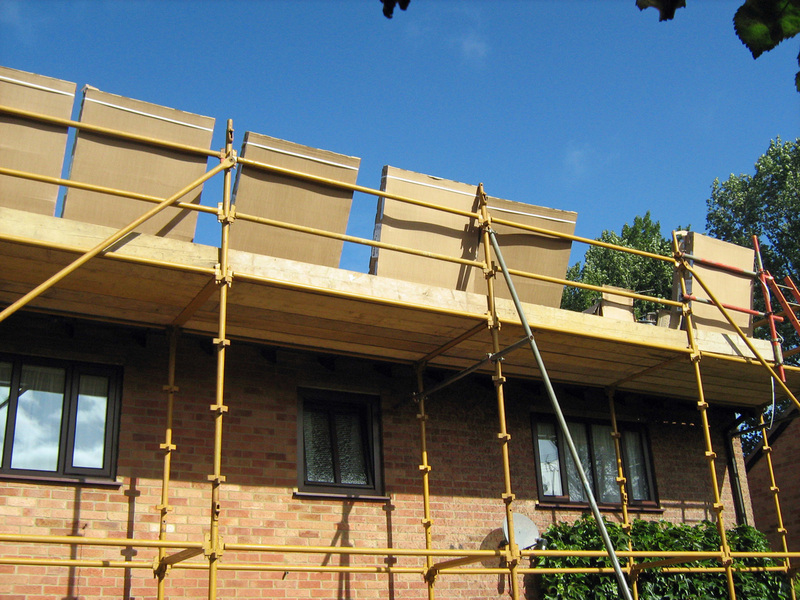 This is arranged by the solar supplier but put up some days in advance by a dedicated scaffolding company. 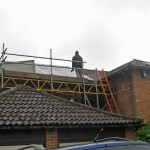 Step 2a is optional – once the scaffolding was in place I used it to check over and then clean the roof. I did the cleaning with a garden hose on a high pressure spray, taking care not to get the water under the tiles and into the loft. I was able fairly quickly to remove 20+ years of accumulated moss and dirt – and, of course, with the panels in place, I may never need to repeat the process. 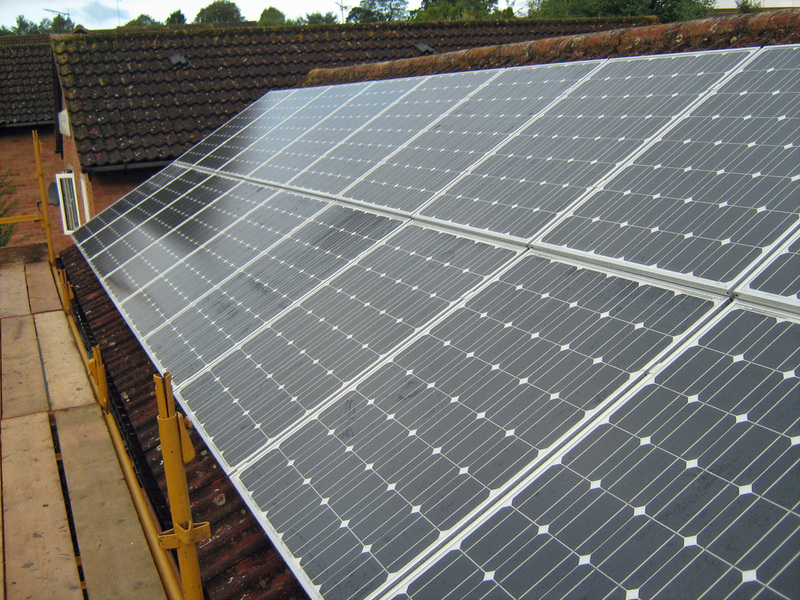 Step 3 is the ‘big day’ when the supplier turns up with the panels and installs them. They go onto a metal frame. 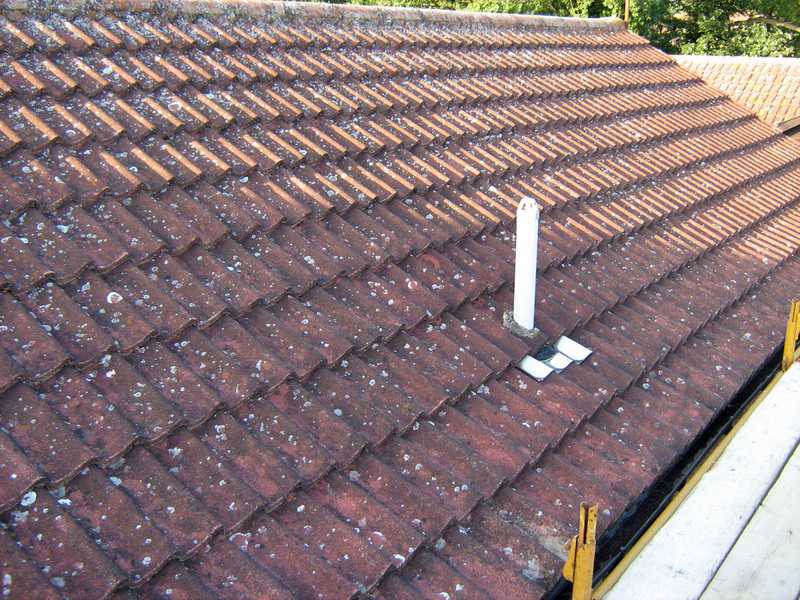 Tiles are lifted at intervals so that metal brackets can be fitted to the roof trestles. These brackets are then joined together to support the panels. The only glitch for us was that there was an open soil stack protruding through the roof that would get in the way of the panels being arranged perfectly. This was replaced by a valved one inside the loft space at no extra charge. Step 4 is the wiring up of the system. The inverter was not available as soon as it was needed so this step ran into a second day for us. Once the system is up and running, and checked over, that’s it. To get the government Feed-In-Tariff you read the generation meter every quarter and notify your electricity supplier of the reading. Shortly afterwards you get the money into your bank account. Meanwhile you are enjoying free energy, and are helping to save the planet – can’t be bad! Previous PostNew Delay for Renault ZoeNext PostHappy Christmas and Joyeux Noël! This topic contains 6 replies, has 4 voices, and was last updated by reboot 4 years, 10 months ago. Whether or not you are considering buying an electric car, if you have the opportunity I would unequivocally recommend having solar panels installed. 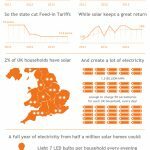 It is interesting to note that solar PV capacity in the UK increased from 70 MW in 2010 to 1014 MW in 2011, an increase of 1352.8% in one year! (according to BP statistical review of world energy 2012). 1014 MW is just over 1 GW, the size of a fairly large conventional power station. As you know, I am interested in fossil fuel depletion which I believe poses a highly significant near term threat. As one example of this, the Office for National Statistics’ latest figures for UK oil and gas production show a whopping 26.9% decline between October 2011 and October 2012. After reading about this subject for the last six year and having done a bit of modeling, here’s a rough guide to what I expect to happen in the rest of this decade. If current trends continue, I expect that the available oil on world markets will be sufficient to provide for India and China alone by the end of this decade. There will not be enough oil to supply major oil importers like the USA, the EU or indeed the UK. This implies a major reduction in available oil. I expect that the consequences of this squeeze will be that the UK will be reliant more or less on its own indigenous (declining) production. The result will be a decline in oil consumption in the UK of roughly two thirds between the start of this decade and the end. Given that two thirds of oil use for motor transport in the UK is by conventional cars, this implies a significant reduction in conventional car use. The remaining third of oil use in motor tranpsort in the UK is for LGV’s, HGV’s and public transport which may be prioritised for fuel in an increasingly difficult economic situation. A similar situation will prevail for natural gas. Talk of fracking for shale gas in the UK is a clear sign of desperation. UK natural gas production fell by 50% between 2000 and 2010 and we are now more reliant on natural gas imports from Norway (by pipleline), Qatar and Algeria (both by LNG shipments) for example. As world oil production enters decline in the second half of this decade, fuel switching for tranport to natural gas will put further pressure on availability and price (listen to Ian Marchant, CEO of Scottish and Southern Energy, talk about this in a video on the website for the UK Industry Task Force on Peak Oil and Energy Security). I live in Scotland where there is a growing renewable electricity generating capacity. There is now over 1 kW of installed renewable electricity capacity in Scotland (mostly onshore wind and hydro) per capita. In 2011, the equivalent of 36% of Scottish electricity use was supplied from renewables. The Scottish Government targets for 2015 is 50% and 2020 100%. As a result of these trends, and where I live, I believe that electricity provides a better long term bet as an energy carrier than either oil or natural gas. I am therefore in the process of adapting my own lifestyle to this trend. In terms of domestic central heating, I have recently installed an infrared heating system which uses electricity very efficiently and controllably to provide heating. We have other plans for water heating – more of this later as this post is long enough! And of course, for transport, an electric vehicle. I presume your system is 4Kw? How many kw did you generate over the last year? 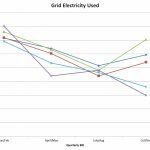 My system is 3.9Kw and I managed to generate 3067kw over the last year. This is certainly one of the best things I have done in fact I was so impressed I had panels put on my father-in-laws house and one of the ones I rent out. It will be interesting to see how to make the most of charging Zoe during the day with some of the free electric. Thanks for your considered post – if you’re interesting in working it up I’d be happy to make it a guest post on the front page. Similarly for your experiences with the IR heating. Yes about 3.9kW too. I’ll go into more details in future posts, but it’s made about 7MWh in two years – a similar rate to yours. I’m in Northampton, so about half way up the country. For anyone living further south it is a ‘no-brainer’! Again, if you’re interested in doing a write-up of your experiences I would love to publish it here. Yes, I’d be delighted to work up a guest post or two. Perhaps you could send me an email to discuss? I am thinking about the outlay for a simple car porch which would contain enough PV cells to supply the Zoe Granny charger.If the charger delivers !0 Amps ,requiring say a 3kx inverter assuming the Zoe will take a charge from an over the counter inverter,the system would remain a 12V DC simple set up staying away from mains complications?